Home / Officially Launched! / Now Selling RJ Sports Golf Bags! Now Selling RJ Sports Golf Bags! We are happy to announce that we have recently added RJ Sports Golf Bags to our website. RJ Sports Golf Bags are some of the best bags on the market. RJ Sports began making golf bags in 1994 and they are still going strong today. They are designed with the best quality for the stylish golfer. 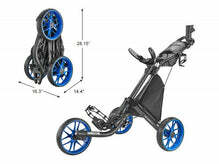 They offer stand bags, cart bags, and transport bags. Order your RJ Sports Golf Bag today through Bye Bye Bogey!